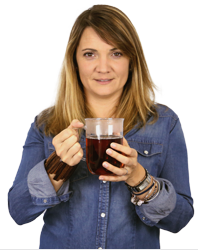 Celine, our tea expert, has selected a great range of tea infusers and filters so you can make the most of your loose leaf tea. Thanks to tea filters and infusers, loose leaf tea has plenty of room to infuse and release all its flavours. We have selected stainless steel tea filters, tea ball infusers and paper filters, as well as all-in-one infusers like infuser mugs and infuser bottles! A real revolution in the tea world! Discover the globe tea infuser made of glass and silicon from VIVA Scandinavia. The glass globe is just pierced to let your tea infuse without leaves escaping in your cup. Clever modern design ! Discover this Tea glass tube infuser by VIVA Scandinavia with a cork stopper. The glass tube is just pierced to let your tea infuse without leaves escaping in your cup. Clever modern design ! VIVA Scandinavia mug with infuser and wooden lid - Contains 350ml. With stainless steel infuser. Ideal for your teas and infusions. Discover this tea infuser spoon with magnet from QDO. Once opened, the infuser turns into a spoon so you can pick loose leaf tea from its box before infusing. Dishwasher-safe. 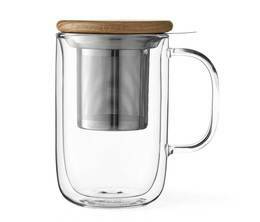 Discover this double wall glass mug with permanent tea filter from Finum. 28cl capacity mug with handle. Ideal to prepare a cup of your favourite loose leaf tea. The 'D-tin' tea ball infuser by Dammann Frères is chained to a cute miniature version of the "Goût Russe Douchka" tin. Stainless steel infuser, 45mm diameter. Try this simple, practical stainless steel tea infuser by Destination. It is especially designed for fine leaf tea: no residues will pass through. Plastic 'Memphis blue' tea ball infuser by Bodum : quick and easy to use ! Its sliding opening system makes it ideal for narrow tea boxes. Discover the Birdie tea ball infuser from QDO. Perfect for enjoying your loose leaf tea wherever you are. A chirpy design ! A set traditionally used in Japan to prepare Matcha tea. A 30cl capacity dark grey metallic tea bowl with a Chasen whisk by Dammann Frères. An original tea infuser shaped like a flower with its own little saucer. Created by Zak!designs. With this cheerful infuser, you will be able to infuse your loose leaf tea in a cup or a mug. Once your tea is brewed, you can place the infuser on the saucer to avoid making a mess. BPA-free. This removable stainless steel tea infuser is made for Contigo WestLoop tumblers. Simple to use. Dishwasher-safe. BPA-free. Yo-Yo red tea filter by Bodum. The Yo-Yo filter is a permanent tea filter made of nylon. The red lid can be used as a receptacle / drainer for your filter. Ideal for the office! A set of 2 small permanent tea filters from Finum® permanent tea filters with drip lid. With an inner diameter between 65 to 95 mm, it is the simplest way to prepare your favourite loose leaf tea in a cup or a mug. This permanent tea filter from Finum floats around so it can diffuse tea throughout the whole drink. Dishwasher-safe. Discover this double wall glass mug with permanent tea filter from Finum. 13cl capacity mug with handle. Ideal to prepare a cup of your favourite loose leaf tea. Discover this 'Yo-Yo' mug with removable infuser from Bodum. The lid will keep your tea warm during the infusion process and even afterwards so you can enjoy a warm tea for longer. 35cl capacity. Dishwasher-safe. This Hot 'n Cool tea set is part of the GOURMET FOOD & DRINKS collection launched by the famous German brand Jenaer Glas. This Chasen bamboo whisk with black wire is traditionally used in Japan to prepare Matcha tea. You can use this Dammann whisk with a matching tea bowl. This 30 cl capacity dark grey metallic tea bowl is traditionally used in Japan to prepare Matcha tea. You can use this Dammann bowl with a whisk. The CILIA filters are ideal to make a cup of tea using your favourite loose-leaf tea. 30 tea filters for your teapot or individual cups. 80 tea filters for your teapot or individual cups. This box contains 100 tea filters with filter sticks. Use a stick to keep the filter steady in your cup during the infusion process. Tea filters made of paper. Matte black stainless steel Westloop tumbler with tea infuser by Contigo. Pink stainless steel Westloop tumbler with tea infuser by Contigo.